September 21, 2017 | BY: K. Aleisha Fetters, C.S.C.S. September 21, 2017 K. Aleisha Fetters, C.S.C.S. 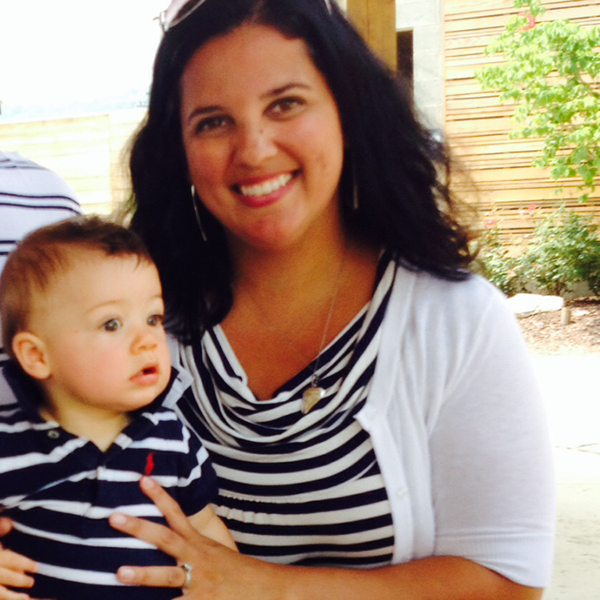 A pregnancy-related health scare pushed Nicole V. to make a sustainable change. Most new moms want to lose baby weight. Nicole was desperate to lose weight. During her pregnancy, Nicole had developed gestational diabetes and, as the condition put her at a high risk of developing Type 2 diabetes later on, she knew her future health depended on losing the weight right then and there. Unfortunately, no matter what she tried, the extra weight clung onto her frame. Despite breastfeeding, she gained more weight during maternity leave. When she finally got back on the scale 10 months after her baby boy was born, she was up to 181 pounds. Feeling sluggish, unhappy, and self-conscious, Nicole didn’t know what to do. Years of fad dieting had never brought her any success, and she thought the only way to lose weight was to drastically cut calories or cut out all carbs — not exactly a sustainable path. At the time, Nicole’s sister was using Shakeology to help her lose weight, and she recommended Nicole give it a try. She also suggested trying 21 Day Fix, a Beachbody program that combines strength training, cardio, yoga, and includes an eating program based on portion-control containers and Shakeology drinks. Nicole was nervous to try another weight-loss program at the risk of failing, but figured failing was better than not trying at all. So, in August of 2015, the then 32-year-old mom took the plunge. When her 21 Day Fix package arrived in the mail, Nicole was nervous, and not sure how she’d manage to fit the program into her already busy life as a full-time mom and attorney. Her food routine at the time consisted of skipping breakfast, eating out, and finishing her son’s leftover mac and cheese or ice cream on the regular. Determined to make a difference, she told herself, “you can do anything for 21 days,” and went all in, using the portion containers to measure her food, drinking Shakeology daily, and working out six days per week. The portion-control containers helped her to really understand the concept of balance. Instead of cutting out all carbs, she could continue eating pasta, rice, or potatoes, just in smaller amounts. One of her favorite “low-carb” snacks was cheese, but it turned out she was eating five times the standard serving size. Once she figured out portions, eating became less stressful and guilt-ridden. Once she started eating clean, she found herself craving more vegetables and healthy foods and less sugar. In her first round of 21 Day Fix, she lost 10 pounds, and was eager to keep going. She used a variety of Beachbody On Demand’s online streaming programs, including P90X3, TurboFire, FOCUS T25, 10-Minute Trainer, and INSANITY. The workouts were all between 10 and 50 minutes, which was perfect for Nicole. Between taking care of a young child, going back to work, and trying to be a good wife and sister, she didn’t have a ton of time to spare. Over time, her workouts and nutrition habits became second nature, as routine to Nicole as brushing her teeth. “My new lifestyle just became a part of me,” she says. Nicole’s commitment ultimately allowed her to achieve what she wanted most — to be healthy and happy for herself and her family. After avoiding the doctor in fear of being told she did in fact have Type 2 diabetes, she finally summoned up the courage to go in July 2016. The doctor performed routine tests on Nicole, and she was ecstatic to find her blood sugar, body mass index, cholesterol, and blood pressure were all normal; her weight had gone from 181 pounds to 123; and she was no longer at risk for diabetes. Today, Nicole says she is “the fittest and happiest I have ever been, and more so every day.” She no longer obsesses over what she’s going to eat or what weight loss trick she should try next. The new Nicole is strong, confident, and unafraid to try new things. She completed a Tough Mudder Half in the fall of 2016, attends pool parties with pride, and plays with her son with the energy she always dreamed of. She’s received tons of support from family, friends, and even strangers on the internet, which has encouraged her to help others as a Beachbody Coach. Getting healthy affected all corners of her life, Nicole says, from sleep to energy to productivity. Even her relationships are better, as a wife, mother, daughter, and friend. Gone are the days of turning down social invitations and avoiding being seen. 2. Celebrate your successes in a healthy way. After losing weight, Nicole rewarded herself with more workouts and new clothes that fit her smaller frame. Find something healthy to use as a reward so you aren’t tempted to grab something sugary as soon as you reach your goal weight. 3. Measure your food. Whether you use Beachbody portion-control containers like Nicole did or a food scale and measuring cups, paying attention to exactly how much you’re eating can help you lose weight without giving up all your favorite foods.